We asked Birch to discuss Morticia. Official Beer Description: The matriarch of bold beer. Darkest shade of black, cappuccino colored frothy head. Nose is an abundance of cocoa beans and molasses. Rich body unveils bitter chocolate and espresso, balanced by hints of fig and black cherries. A warming alcohol reminds this Imperial Stout is a rare experience! 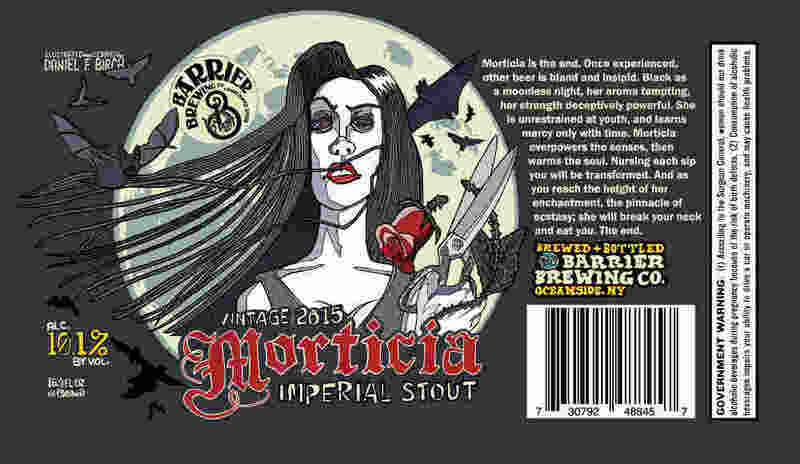 Daniel F. Birch: Morticia will be the fourth bottle label I've designed for Barrier that the brewery has released. Getting to draw this one was a real honor, as I loved the original label drawn by the insanely talented Squigs in 2013—notably the eerie, powerful pose of the titular character and the backdrop of gravestones. Hopefully this is received by the public just as well. I first drank Morticia at Jimmy's No. 43. This was probably three months ago and I remember it was a really smooth, full-bodied Russian imperial stout that would be more perfect with how chilly it's gotten outside lately. The flavors of burnt chocolate and coffee make it a really good beer to warm up with on a cold winter night. My inspiration for this label, like the original, was an obvious one and it made the process a lot of fun: The Addams Family. I'm a fan of Chas Addams' comics, and who isn't? 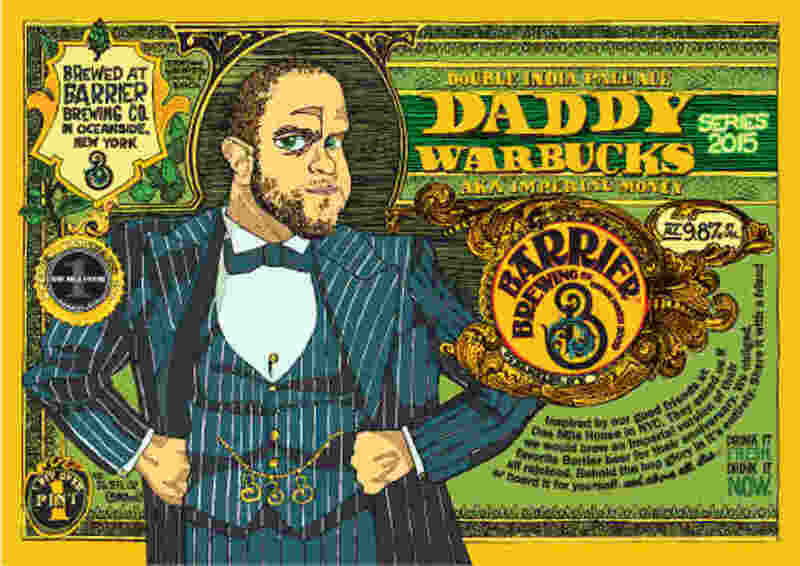 They're some of the first comics that poke fun of the status quo and they do it so well. As part of my research I watched the campy 1991 movie, The Addams Family, and got caught by one particular scene where Anjelica Huston, who played Morticia Addams, was cutting roses off the vine. So I used that scene as the jumping off point. I based my Morticia somewhat on a friend of mine, Lauren Tanchum, as well as a few different goth-girl photos, while the sheers I drew are actually these turn-of-the-century clothing shears I found on the sidewalk walking home from work a few years back. I like to joke that they were probably used in a murder as they are massive and very sharp, but the only thing they probably cut through was fabric. When these bottles are released, here's an Easter egg to look out for: her pupils are black skulls. There's a chance that the next time we bottle this the bottle will glow in the dark. I think that effect would look really nice. Regardless I'm really pleased to be working with Barrier on its new, widely available bottles. There are several labels that will be rolling out over the next few months that rock as much as the beers they represent.